Dr. Brown seeks to separate myth from fact when it comes to the “New Apostolic Reformation” (NAR), taking both negative and positive calls on the subject. He’ll also weigh in on relevant, major news. Listen live here 2-4 pm EST, and call into the show at (866) 348 7884 with your questions and comments. Instead, Michael Brown misrepresented Christians and only further added to the confusion of what the NAR is and what it believes. For Michael Brown to claim he is a Pentecostal or a Charismatic is to bear false witness against the very God he claims to love and serve. If he was Pentecostal or a “so-called” Charismatic, he would preach the Christian gospel of salvation, not a gospel of the cults. Pulpit & Pen weighs in on Brown’s feeble attempt to tackle the NAR on his ‘Line of Fire’ program. Dr. Michael Brown is the go-to apologist for modern-day Montanists. Montanism is a heresy that arose early in church history, founded by its leader, Montanus, that believed, much like the charismatics of today, in ongoing prophecy and extra-biblical revelation. The movement was anathematized by the early Church, and it’s followers considered outside of orthodox Christianity. The New Apostolic Reformation (NAR) is a subset of modern-day Montanists that believe that the biblical office of Apostle is still open (or has been re-opened) today. The name, New Apostolic Reformation, was coined by the late C. Peter Wagner and continues to be the term used to describe the movement. Some of the key tenets of the New Apostolic Reformation are: an ecclesiology that believes in governing Prophets and Apostles, a commission that focuses on harbingers and the “Seven Mountain Mandate,” (more on that later), Kingdom authority, and a faith that focuses less on sound, biblical theology, and more on “experience.” In many ways, the New Apostolic Reformation holds to a false Jesus, one who is centered around Gnostic/Shaman beliefs, and a false Gospel that places the emphasis on the Kingdom and Dominion as opposed to Christ alone. Michael Brown, a well-known apologist for charismatic and New Apostolic beliefs has continued to deny even the existence of the New Apostolic Reformation, yet he continues to defend the tenets of this dangerous and erroneous theology under the guise of “Pentecostalism,” or “Charismaticism.” Brown has been given a pass for far too long by evangelical theologians and apologists, as his aberrant beliefs cause serious damage to the true Gospel. I want to be clear that I cannot and will not make a judgment on Michael Brown’s salvation, however, his actions and his theology deserve to be scrutinized, and Brown should be considered a danger to the commission of the church until he repents. Brown has clearly shown himself to be in theological alignment with the New Apostolic Reformation. Recently, he invited one of Today’s most notorious NAR leaders, Bill Johnson, on his program and defended him. After mollycoddling the false teacher during the entire program, he was confronted on Twitter about his failure to ask Johnson any tough questions, and went on the defensive. He then stated that he would be unable to interact on Twitter, and gave an invitation to call into his show for discussion. Notice that Brown never even mentions the Gospel in this supposed salvation event of his “friend in India.” Romans 1:16 clearly teaches that it is the Gospel that is the power to save everyone who believes, and it is the preaching of that Gospel that brings faith (Romans 10:17)–a work of the Holy Spirit. Yet, Brown clearly aligns with the New Apostolic false teaching that extra-biblical manifestations and appearances bring faith and salvation. Where is the emphasis on the preaching of Christ crucified, buried, and resurrected? There was no mention of it. What Dr. Brown spoke of here was a false gospel–not the biblical gospel. The Scriptures don’t call us to be “counter-culture revolutionaries,” or “culture warriors.” The Scriptures call us to a witness for Christ by proclaiming His Gospel–that is Christ’s finished work on the cross and being raised from the dead (Mark 16:15 Matthew 10:7, Matthew 28:19-20)–and calling people out of the world, out of the culture, and into repentance and faith. Jesus’ Kingdom is not of this world (John 18:36). The New Apostolic Reformation seeks to usher the kingdom into this world by taking dominion. This is counter-Gospel and unbiblical at best and dangerous heresy at worst. When compared to what the Bible teaches about the true physical presence of God, glory clouds do not measure up to biblical scrutiny. God’s presence doesn’t manifest in a cloud with glitter and sparkles, His presence fills the whole earth (Isaiah 6:3), causing everyone to tremble (Exodus 16:16), and people will fall at his feet as though dead (Revelation 1:17). The question becomes, what is the Scriptural foundation for believing that these so called “glory clouds” are truly a work of God? Brown denies any association with the New Apostolic Reformation, yet incessantly defends all of the false teachers who are clearly leaders in this movement, even when they are irrefutably show to be in error. Brown resorts to his tactic of playing dumb; “I really don’t know that much about Benny Hinn, I was just there to reach his audience,” or “I really haven’t read all of C. Peter Wagner’s books, he’s written too many,” etc. He will never go beyond saying that he “has concerns” about “some of the practices” of these false teachers, and will never admit that they are in grave error. Further, he redefines terms such as ‘Prophet’ and ‘Apostle’ to mean something that isn’t taught in Scripture and imposes his definition onto the false teachers such as Wagner and Johnson that they don’t adhere to in their theological teachings either. Brown apparently desires to mainstream the theology of the New Apostolic Reformation but acknowledges that the NAR has a lot of baggage that makes it impalatable to many mainstream Christians. I suspect this is why he so definitively denies association with it. 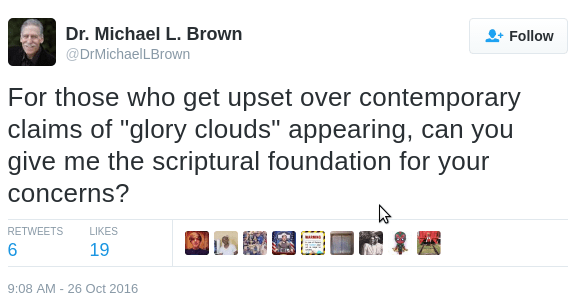 Yet, Brown clearly does not want to be challenged by anyone who incontestably stands on the authority of God’s Word. As Chris Rosebrough called into his show, there was no dialogue, there were no real answers to Chris’ questions–it was basically an affirmative speech in defense of erroneous, unbiblical teachings while denying his association with false teachers. Further, Brown has been challenged to a debate by JD Hall, in which Brown has refused on the basis that JD is “too dangerous.” How Dr. Brown can justify calling JD, a pastor who stands firmly on the Word of God as his final authority, is too dangerous, while defending false teachers like Benny Hinn, Rick Joyner, Mike Bickle, Brian Houston, Carl Lentz, Jonathan Cahn, and many others is stupefying. 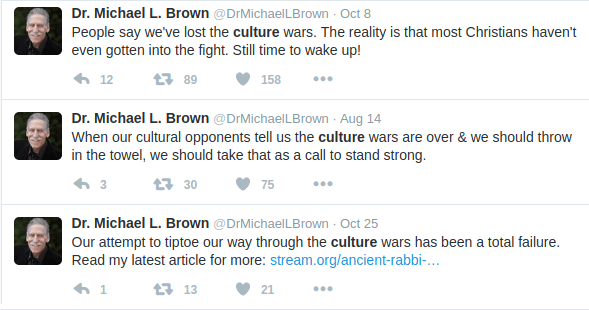 Dr. Brown only wants to talk to people who won’t call him what he is, biblically. He needs to be affirmed. He needs to be told that “while we may disagree on some things, we can still be brothers.” He can carry an argument where man’s intellect is the premise of the opponent’s claim and limits are placed on God’s Word, but if someone is willing to stand firmly on the Scriptures and mark false teachers, as commanded in Romans 16:17-8, and expose their lies as commanded in Ephesians 5:11, then he will flee from you. You see, God’s Word is a powerful two-edged sword that Dr. Brown can’t defend himself or his false teachings against (Hebrews 4:12). That is the real “danger” that Michael Brown is unwilling to face.